Liver glycogen plays a key role in regulating food intake and blood glucose. Mice that accumulate large amounts of this polysaccharide in the liver are protected from high-fat diet (HFD)-induced obesity by reduced food intake. Furthermore, these animals show reversal of the glucose intolerance and hyperinsulinaemia caused by the HFD. The aim of this study was to examine the involvement of the hepatic branch of the vagus nerve in regulating food intake and glucose homeostasis in this model. We performed hepatic branch vagotomy (HBV) or a sham operation on mice overexpressing protein targeting to glycogen (Ptg OE). Starting 1 week after surgery, mice were fed an HFD for 10 weeks. HBV did not alter liver glycogen or ATP levels, thereby indicating that this procedure does not interfere with hepatic energy balance. However, HBV reversed the effect of glycogen accumulation on food intake. In wild-type mice, HBV led to a significant reduction in body weight without a change in food intake. Consistent with their body weight reduction, these animals had decreased fat deposition, adipocyte size, and insulin and leptin levels, together with increased energy expenditure. Ptg OE mice showed an increase in energy expenditure and glucose oxidation, and these differences were abolished by HBV. Moreover, Ptg OE mice showed an improvement in HFD-induced glucose intolerance, which was suppressed by HBV. Our results demonstrate that the regulation of food intake and glucose homeostasis by liver glycogen is dependent on the hepatic branch of the vagus nerve. Iliana López-Soldado and Rebeca Fuentes-Romero contributed equally to this study. The main cause of obesity and overweight is an imbalance between energy consumption and energy expenditure. Several mechanisms are involved in maintaining energy homeostasis. Secreted humoral factors convey information about energy storage from adipose tissue to the central nervous system (CNS). In addition to these factors, neuronal signals play key roles in energy homeostasis [1, 2, 3, 4]. Hepatic signals are postulated to be transmitted to the CNS by the vagus nerve because vagal activity is increased by portal or jejunal infusion of lipids . Several reports have highlighted the contribution of the vagus nerve to regulating food intake. The stimulation of feeding by 2,5-anhydro-d-mannitol was shown to be dependent on this nerve . Hepatic branch vagotomy (HBV) blocks the stimulation of satiety by a variety of fuels . In addition, the hepatic vagus nerve mediates fat-induced inhibition of diabetic hyperphagia by enabling the restoration of hypothalamic neuropeptide expression [8, 9]. Furthermore, inhibition of fatty acid oxidation by mercaptoacetate increases food intake, and this effect is abolished by HBV . Furthermore, HBV has been shown to attenuate the feeding response to peripheral 2-deoxyglucose [11, 12, 13]. The search for a metabolic sensor that regulates food intake has been actively pursued for many years. Mayer  developed the ‘glucostatic’ theory of feeding behaviour, proposing that changes in glucose utilisation rates regulate hunger and satiety. Russek [15, 16] later put forward a ‘hepatostatic’ theory, which was further refined by Flatt into the ‘glycogenostatic’ model , in which hepatic glycogen stores act as a glucoreceptor involved in the regulation of food intake. Langhans and colleagues described a relationship between hepatic glycogen levels and spontaneous eating . In the following years, a large body of experimental evidence established an association between the size of glycogen stores in the liver and the regulation of food intake [19, 20, 21, 22, 23]. We recently showed that mice that accumulate high levels of hepatic glycogen are protected from high-fat diet (HFD)-induced obesity as a result of reduced food intake . We propose that increased liver glycogen stores contribute to decreased appetite and adiposity, and that this effect is probably triggered by signals from the liver that are transmitted to the brain via the hepatic vagus nerve. To test this hypothesis, we studied the effects of HBV in mice overexpressing protein targeting to glycogen (Ptg OE) and control mice fed a HFD. All procedures were approved by the Barcelona Science Park Animal Experimentation Committee and carried out in accordance with the European Community Council Directive and the National Institute of Health guidelines for the care and use of laboratory animals. Mice that overexpress Ptg (also known as Ppp1r3c) in the liver (Ptg OE) were generated as previously described . Male Ptg OE and control mice were housed with free access to water and a standard chow diet (Envigo, Indianapolis, IN, USA) before surgery. Starting 1 week after surgery, mice were fed a HFD (45% fat content; D12451 Formula, Research Diets, New Brunswick, NJ, USA) for 10 weeks. The common hepatic branch of the vagus nerve of 6-week-old mice was cut. Briefly, mice were anaesthetised with isoflurane (2–3% with O2) and placed on a surgical heating pad. After the abdominal region had been shaved and disinfected, laparotomy was performed. The hepatic lobules were gently displaced in a dorsal anterior direction. The ligaments surrounding the liver were removed to expose the oesophagus and stomach. The hepatic branch of the vagus nerve was then separated from the left side of the liver. Care was taken not to damage the dorsal and ventral parts of the vagus that innervate the stomach and abdominal tissue. The abdominal wall and skin were then closed. Buprenorphine was administered, together with 0.9% NaCl, to compensate for intraoperative fluid loss. Control mice underwent a sham operation, i.e. we repeated the surgery without cutting the nerves or connective tissue. After surgery, mice were housed individually for the remainder of the experiment. After 10 weeks on the HFD, mice were either fed or fasted for 16 h before being killed. Tissues were collected and stored at −80°C until analysis or preserved in 10% phosphate-buffered formalin for histological analysis. Hepatic glycogen was quantified as previously described . The intracellular concentration of ATP was measured in perchloric acid extracts of livers by HPLC. Approximately 50 mg frozen tissue was homogenised in 500 μl 10% HClO4. Samples were clarified at 3000 g at 4°C for 15 min and supernatants were neutralised with 0.5 M K2CO3. Samples were placed on ice for 5 min and then centrifuged at 3000 g at 4°C for 10 min. ATP analysis was performed using a Brisa LC2 C18 column (4.6 × 150 mm, 3 μm particle size) interfaced with a photodiode array detector (260 nm) and a constant flow rate of 0.6 ml/min. ATP was separated using a mobile phase gradient (70:30 ratio of eluent A [500 mmol/l KH2PO4, 4 mmol/l (C4H9)4N(HSO4), pH 6]/methanol) for 37 min and quantified against known standards in eluent A. Liver lactate was measured in perchloric acid extracts using a commercial spectrophotometric kit (Horiba, ABX, Montpellier, France). Blood glucose levels were measured using a glucometer (Ascensia Breeze 2, Bayer Healthcare, Leverkusen, Germany). Plasma insulin and leptin were analysed by ELISA (Crystal Chem, Downers Grove, IL, USA). Glucose tolerance tests were performed as previously described . Indirect calorimetry was performed using an eight-chamber Oxymax system (Columbus Instruments International, Columbus, OH, USA) to measure energy expenditure, calculated from oxygen consumption and carbon dioxide production, as previously described . In order to monitor food intake, mice were housed individually and food was measured daily. Total RNA was isolated from frozen liver samples using Trizol reagent (Life Technologies, Carlsbad, CA, USA) and purified with an RNeasy Mini Kit (Qiagen, Hilden, Germany) and treated with DNase I (Qiagen) to degrade genomic DNA. Reverse transcription was then performed using qScript cDNA Synthesis Kit (Quanta Biosciences, Beverly, MA, USA). Quantitative (q)PCR was performed using a Quantstudio 6 Flex (Applied Biosystems, Foster City, CA, USA). The following TaqMan primer and probe sets (Applied Biosystems) were used for qPCR: Pklr (Mm 00443090_m1), Ppia (Mm02342429_g1). The latter was used as a reference gene. A portion of subcutaneous fat was H&E stained and adipocyte size was measured as previously described . Data are expressed as means ± SEM. Groups were compared using two-way or three-way ANOVA with post hoc Tukey tests. A p value of <0.05 was considered significant. Ptg OE and wild-type mice underwent HBV or a sham operation, followed by a HFD for 10 weeks. First, we measured the glycogen content of livers of the different experimental groups. In the fed state, Ptg OE mice showed a twofold increase in liver glycogen compared with control animals (Fig. 1a). After overnight fasting, control mice had lower hepatic glycogen levels, while Ptg OE mice maintained similar levels as in the fed state (Fig. 1a). Furthermore, there were no differences in liver glycogen levels between sham-operated and HBV groups, indicating that hepatic denervation did not alter the liver glycogen content (Fig. 1a). To examine whether HBV affects hepatic energy status, we measured ATP levels in the liver. The hepatic ATP content was higher in Ptg OE mice compared with control mice in the fed state. ATP levels decreased significantly in control mice in the fasted state compared with the fed state; in contrast, ATP levels in the livers of fasted Ptg OE mice were similar to those in the fed state. Remarkably, we did not observe changes in the level of ATP between HBV and sham-operated groups for either genotype (Fig. 1b). Levels of liver lactate increased in Ptg OE mice compared with control mice in the fasted state (Fig. 1c). The mRNA levels of pyruvate kinase in the livers of Ptg OE mice were also higher under fasting conditions compared with those of control mice (Fig. 1d). There were no differences in hepatic lactate levels or mRNA levels of Pklr between sham-operated and HBV groups (Fig. 1c, d). To study whether HBV has an effect on food ingestion, we measured food intake. Consistent with our previous report , sham-Ptg OE mice ate less compared with sham-control animals (Fig. 2a) when fed a HFD. However, HBV-Ptg OE mice had a similar food intake to that of HBV-control animals, indicating that HBV reversed the effect of PTG overexpression on food intake. In control mice, HBV did not have any effect on food intake. Next, we studied the contribution of the hepatic vagus nerve to body weight and fat weight in control and Ptg OE mice. Ptg OE mice had a lower body weight than control mice when the hepatic vagus nerve was intact. However, this difference was not observed between HBV-Ptg OE and HBV-control mice, which had similar body weights (Fig. 2b). Body weights of sham-Ptg OE and HBV-Ptg OE mice were also similar (Fig. 2b). Furthermore, HBV caused a reduction in body weight in control mice (Fig. 2b). Consistent with their reduced body weight, HBV-control mice had a decrease in subcutaneous fat weight, epididymal fat weight and adipocyte size compared with sham-control mice (Fig. 2c–e). As previously described , sham-Ptg OE mice had a lower subcutaneous fat weight and a lower adipocyte size compared with sham-controls (Fig. 2c, e). In contrast, HBV blocked the decrease in adipose tissue weight and adipocyte size seen in Ptg OE mice. These observations thus indicate that the vagus nerve mediates the remote effects of hepatic glycogen content. We next investigated whether HBV has an impact on energy expenditure. In control mice, HBV led to a significant increase in energy expenditure throughout the light and dark phases. Ptg OE mice showed greater energy expenditure during the light and dark phases when the vagus nerve was not ablated (Fig. 3a). This difference in energy expenditure was abolished by HBV (Fig. 3a). As previously described , Ptg OE animals showed an increase in the respiratory exchange ratio, indicating that they used more carbohydrates as an energy source compared with the control group. This increase was reversed by HBV (Fig. 3b). Consistent with this finding, glucose oxidation was increased in Ptg OE mice compared with control mice, and HBV abolished this effect (Fig. 3c). No differences in physical activity were found between groups (data not shown). Consistent with our previous report , sham-Ptg OE mice had lower blood glucose levels and lower plasma insulin concentrations than sham-control animals when fed a HFD (Fig. 4a, b). Remarkably, in the fed state, Ptg OE mice failed to reduce blood glucose and insulin levels when the vagus nerve was ablated (Fig. 4a, b). HBV had no effect on glycaemia (Fig. 4a) but led to a decrease in plasma insulin levels in control mice (Fig. 4b). Leptin serum levels were also significantly reduced in HBV-control mice compared with sham-control mice (Fig. 4c), and HBV blocked the decrease in serum leptin induced by hepatic glycogen (Fig. 4c). 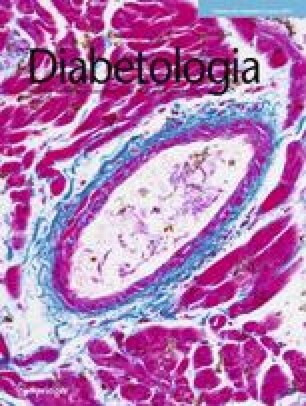 Ptg OE mice showed improved glucose tolerance compared with controls (Fig. 5), and HBV abolished this effect (Fig. 5). These observations demonstrate that liver glycogen regulates glucose metabolism through the vagus nerve. Here, we studied the involvement of the hepatic branch of the vagus nerve in regulating food intake and glucose homeostasis in Ptg OE mice, which accumulate high levels of glycogen in the liver. These mice showed reduced food intake and a reversal of glucose intolerance when fed a HFD . We demonstrated that HBV abolishes the effect of glycogen accumulation on food intake. In contrast, HBV-control mice ate the same amount of food as sham-control animals when fed a HFD. This finding is in line with observations made in previous studies of rats [25, 26] and mice . It is noteworthy that although both HBV groups and sham-control mice had similar food intakes, they did not weigh the same. This finding suggests that HBV causes a decrease in body weight and promotes resistance to diet-induced obesity. Thus, loss of the nerve connection itself had an impact on body weight independent of glycogen accumulation, as described by two recent studies in rats  and mice . Consistent with their reduced body weight, our HBV mice had a decrease in subcutaneous fat mass, smaller adipocytes and lower levels of leptin in plasma. Similar results have been reported in various studies [2, 27, 28, 29]. Taken together, these observations reinforce the notion that HBV reduces body weight and induces resistance to diet-induced obesity. In an attempt to explain the metabolic changes observed after HBV, we examined whole body energy expenditure. Sham-Ptg OE mice had an increase in energy expenditure, which, together with their lower food intake, could explain the lower body weight of this group. Energy expenditure also differed between HBV-control mice and sham-control mice, in accordance with the findings of Gao et al . These authors reported an increase in energy expenditure during the dark phase in HBV mice compared with sham-operated mice, concluding that this increase may account for the reduction in body weight of the former. Moreover, Ptg OE mice oxidised more glucose than control mice, and HBV abolished this effect. These findings indicate that neuronal signals through the hepatic vagus nerve are also involved in regulating carbohydrate oxidation in these mice. As previously described, PTG overexpression resulted in an increase in liver glycogen. Consistent with previous results , HBV did not affect liver glycogen levels. Moreover, our results demonstrated that Ptg OE mice fed a HFD had higher ATP levels compared with control mice, and that HBV did not interfere with hepatic ATP levels, as previously reported . Fasted Ptg OE mice activated glycolysis (indicated by the increase in lactate and Pklr mRNA levels), suggesting that this mechanism could be one way in which Ptg OE mice maintain ATP levels in the liver. ATP is a key metabolite that triggers food intake through the vagus nerve [6, 31]. It has been hypothesised that an increasing ATP concentration in the hepatocytes inhibits the firing of hepatic vagal afferents, inhibits activation of the nucleus tractus solitarius, and suppresses the appetite . Since sectioning the hepatic vagus eliminates most of these responses, it is presumed that ATP levels in the hepatocyte are conveyed to the CNS via vagal nerves. Therefore, liver glycogen, through maintaining hepatic ATP levels, contributed to decreasing appetite and this effect was triggered by the vagus nerve. In rats, it has been shown that sensory vagal fibres do not provide substantial direct innervation of hepatocytes, but rather with portal triads in proximity to branches of the hepatic artery, portal vein and bile ducts . However, neuroanatomical data for the vagus in mice are limited. In fact, several reports in mice describe metabolic information in the liver being transmitted to the brain via the hepatic vagus [2, 34, 35, 36]. Nonetheless, we cannot exclude the possibility that the mechanism described in our study depends on sensors located in the portal region. Another factor that could complicate the interpretation of the data is that cutting the common hepatic vagal branch denervates not only the liver but also parts of the gastrointestinal tract . Despite these neuroanatomical difficulties, the evidence presented here highlight the liver as a powerful metabolic sensor, and a crucial link in the brain regulation of energy metabolism . There is a link between the CNS and hepatic glucose production  that involves the hepatic branch of the vagus; however, this link is efferent, not afferent . Moreover, intact vagal afferent fibres are required for glucocorticoid-induced glucose intolerance . Ptg OE mice showed an improvement in HFD-induced glucose intolerance, which was abolished by HBV. This observation indicates that an intact vagus nerve is required for HFD-induced glucose intolerance. This notion is consistent with a recent study in dogs indicating that hepatic glycogen regulates hypoglycaemic counter-regulation via a liver–brain axis . In our model system, HBV lowered insulin without changing glucose levels, indicating increased insulin sensitivity. In rats, HBV has been reported to induce insulin resistance [40, 41]. However, in dexamethasone-treated mice, HBV resulted in greater insulin responsiveness during insulin tolerance testing compared with sham surgery, and this effect persisted for at least 3 months after the surgery . Thus, in models in which insulin resistance is already present, for example, as induced by glucocorticoids  or in young animals fed a HFD , HBV seems to increase insulin sensitivity. Rather than being a direct consequence of liver denervation , our findings support the hypothesis that a neural signal to the CNS is involved in the inhibition of food intake caused by liver glycogen accumulation. Therefore, we conclude that liver glycogen accumulation triggers a liver–brain neuronal network to regulate food intake and glucose homeostasis. The authors thank M. García Rocha, A. Adrover, E. Veza, N. Plana and A. Berenguer, all from the Institute of Research in Biomedicine (IRB Barcelona) and staff of the Scientific and Technological Services of the University of Barcelona for technical assistance. This study was supported by grants from the Spanish MINECO (SAF2014–54525-P), Fundació Marató de TV3 (201613-10) and CIBERDEM (Instituto de Salud Carlos III, Spanish Ministry of Science and Innovation). None of the supporting agencies had any role in performing the work or in writing the manuscript. IL-S, JJG and RF-R conceived the study and designed all experiments; JJG directed the study; IL-S and RF-R analysed the data; IL-S, JD and JJG interpreted the data; IL-S and RF-R wrote the manuscript. All authors approved the final version of the manuscript to be published. JJG is responsible for the integrity of the work as a whole.